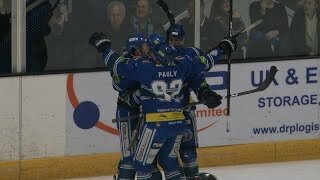 Despite a fight back in the middle period after going 3-0 down in the first, the Genting Casino Coventry Blaze left Manchester with a 5-2 defeat to the Storm. 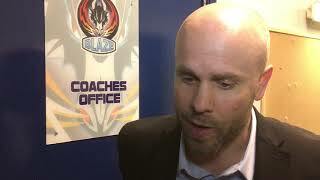 Without long-term absentees Miika Wiikman and Ross Venus, the opening twenty minutes was certainly one to forget for the Blaze with American forward Rob Linsmayer scoring twice (5.04 and 17.26). The home sides Man of the Match also assisting their second which was netted by Evan Richardson, the provider of Linsmayer’s first. After Coventry Head Coach Danny Stewart called a time-out at three down, Canadian defenceman Justin Hache dripped the gloves and went toe-to-toe with Linden Springer following a big hit by the Blaze man, later assessed 2+10 checking to the head (17.57). The second was almost a role reversal of the first, this time with Blaze dominating. Tim Crowder made it a 3-1 game at 21.49, assisted two-on-one by Alex Nikiforuk who then struck himself to make it a one goal game on 28.48. The comeback however wasn’t to be as Riley Stadel registered the only powerplay goal of the night on 41.31, Richardson getting a second assist of the night. With the clock ticking down, Miroslav Kopriva was pulled from the Blaze net, giving Dane Byers the chance to end the scoring 5-2 (58.53). The two sides will meet again tomorrow night at the Skydome Arena with a 5.15pm face-off.